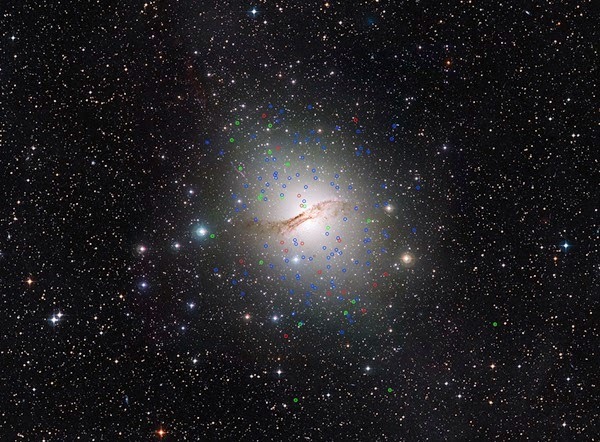 Info Astronomy - Observations with the European Southern Observatory’s (ESO) Very Large Telescope (VLT) in Chile have discovered a new class of “dark” globular star clusters around the giant galaxy Centaurus A. These mysterious objects look similar to normal clusters, but contain much more mass and may either harbor unexpected amounts of dark matter or contain massive black holes — neither of which was expected nor is understood. Globular star clusters are huge balls of thousands of stars that orbit most galaxies. They are among the oldest known stellar systems in the universe and have survived through almost the entire span of galaxy growth and evolution. The elliptical galaxy Centaurus A (NGC 5128) is the closest giant galaxy to the Milky Way and is suspected to harbor as many as 2,000 globular clusters. Many of these globulars are brighter and more massive than the 150 or so orbiting the Milky Way. Matt Taylor and his team have now made the most detailed studies so far of a sample of 125 globular star clusters around Centaurus A using the FLAMES instrument on ESO’s VLT at the Paranal Observatory in northern Chile. They used these observations to deduce the mass of the clusters and compare this result with how brightly each of the clusters shines. For most of the clusters in the new survey, the brighter ones had more mass in the way that was expected — if a cluster contains more stars, it has greater total brightness and more total mass. But for some of the globulars, something strange showed up: They were many times more massive than they looked. And even more strangely, the more massive these unusual clusters were, the greater the fraction of their material was dark. Something in these clusters was dark, hidden, and massive. But what? There were several possibilities. Perhaps the dark clusters contain black holes or other dark stellar remnants in their cores? This may be a factor that explains some of the hidden mass, but the team concludes that it cannot be the whole story. What about dark matter? Globular clusters are normally considered to be almost devoid of this mysterious substance, but perhaps for some unknown reason, some clusters have retained significant dark matter clumps in their cores. This would explain the observations but does not fit into conventional theory. These objects remain a mystery. The team is also engaged in a wider survey of other globular clusters in other galaxies, and there are some intriguing hints that such dark clusters may also be found elsewhere.